Years ago I clipped this from Martha Stewart Living; it's still one of my favorite ways to cook pork chops. Depending on what kind of time you have, you can either let the chops marinate all day in the refrigerator, or let them marinate while you put the rest of dinner together. In a medium bowl or shallow dish, combine the ingredients for the marinade: the juice of the oranges and limes, vinegar, mustard, garlic, the leaves from the fresh thyme (or freshly crumbled dried thyme), salt, pepper, and 1 Tbsp. olive oil. Add the chops, toss to coat, and leave to marinate for at least 30 minutes. Heat a cast-iron or heavy skillet over medium heat, then add the remaining oil. Remove chops from the marinade, reserving the marinade, and carefully lower into hot pan. Cook chops for 5 minutes on each side. Add marinade, lower heat, and cook, covered, for 7 minutes, turning once. Remove chops from pan and set aside. Turn up heat to medium-high and reduce the marinade until thick and saucy. Remove pan from heat, stir in butter, and whisk until smooth. 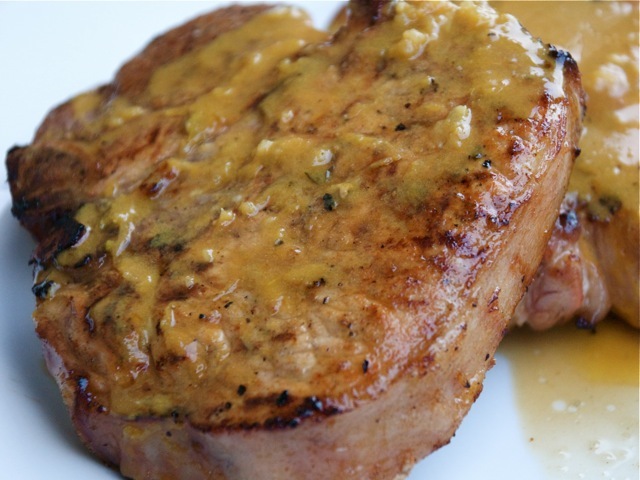 Pour sauce over chops and serve.